There’s an old rake in our shed with a handle worn smooth from use. We inherited it from Jilda’s mom Ruby along with many other things. Our great nephew Jordan loves playing with the rake. The first time he saw the old tool, he immediately understood its purpose, and within a few minutes had raked up a mountain of pine straw which he used to practice his swan dive. This tool will still be useful long after we’re gone but this is not the case with other ones that became obsolete as technology evolved. For example, a few days ago when I lost a bolt on the garden tiller, I headed to the barn. Jilda’s dad Sharkey never threw away a nut or bolt, but tossed them in a bucket. Whenever I need small pieces of hardware, I look there first. Over in the corner, I noticed an old plow. 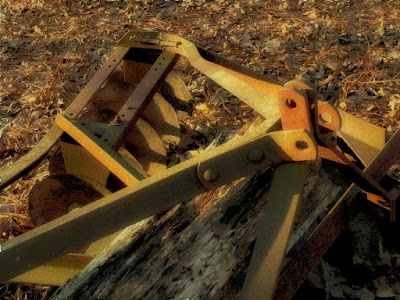 Beginning at the turn of the last century, farmers hitched these tools behind scrawny mules to break ground for gardens. The first time I saw one in use was when my cousin James Lee Robbins plowed my mama’s garden in the late 1950s. He used unique words to communicate with the old mule. “Gee” meant turn one way and “haw” meant turn the other. Dragging the old plow, he managed to break up a nice garden plot in a little over an hour. The plow in the barn has been there since we moved here in 1980. I could sell it for scrap but I keep it to remember how far things have come. Another tool we inherited was a “clinker-getter” tool. I named it that because I was unsure what the real name was. It’s a device about three feet long with a mechanical pincher. People used it to remove clinkers from a coal-burning stove or fireplace without burning their hands. It’s no longer useful for that, but I repurposed it for entertaining visiting kids. You wouldn’t believe the things they do with this device. I’ve seen it used for picking up June bugs and flinging rocks. Grownups also find it handy as a steely mouthed monster used to terrorize a yard-full of young’uns. It is a handy tool. I’m glad we kept it all these years. The tools treasured by those who came before us were vital for survival. These devices that were used to scratch out a living from the land are now considered relics. The only place you see them today is hanging from the ceiling at Cracker Barrel. As the nature of work changed, so did the tools we use. There’s not as much heavy lifting today, even with jobs requiring manual labor. I’m sure my nephew Haven who is a plumber would argue this point, but even he would be the first to admit that tools have made his life easier. These days, much of my work requires computer keyboards, small digital cameras, electronic communications, and social networks. A majority of the heavy lifting I do now is mental. But some days after hours on a keyboard, it feels as if I had spent the day hoeing cotton. As I wrote this column, I tried to imagine what early settlers would make of things today. I’m sure they would struggle with how much tools have changed. It took hours of sweat and toil to break up a garden spot of a few acres with a mule and plow. I’m sure it would be difficult to wrap their reins around the fact that today they could sit in the air-conditioned cab of a high-end tractor and break up the same plot in minutes. I read where that some of these old tools are making a comeback for people moving “back to the land.” I’d be willing to bet if the early settlers had a choice between cussing a mule or riding on a tractor, they would choose the latter. My dad used a hand drill and a "yankee screwdriver*" for years. Very handy especially for small jobs when battery operated tools were not available. I suspect you are right, except that it is easier to determine what the problem is with a recalcitrant mule. And often simpler to fix too. You better believe the old timers would choose something that is easier and better. It's neat to see the old tools and even try and use them for fun but not to have to live that way. 35 years ago, we moved into a crazy old farmhouse --inner walls were solid stacked 2x4s-- and needed a door where a window was. Best tool for the job was my grandfather's 7-foot-long 2-man saw. Glad I saved it (Nails would have wrecked a chainsaw). It's still in the barn. I saw the neighbor the other day cutting her grass with a whip blade or scythe. She wasnt making much progress but its all she had after her mower went out. Another neighbor ended up letting her use his mower. Im glad. We have an Amish community not far from us and you often see them using old tools while working in the fields. Heaving mind lifting can be just as tiring, I'm thinking. I love this entry (column) I don't know how I am missing entries, but we have had company. I enjoy how you are able to take me back. There are many questions I wish I had asked my dad, but it is too late now. A huge horse drawn hay rake sits in my sons yard, he rented a bob cat to make a small road to get it out of the woods at a house we were remodeling. He is very proud of that tool, I am too. (I will have to hire a proofer, unless I can cut back on comments. Thanks for a memory ride, love 'em more and more. I agree: they'd choose the latter. Your old tools are a good reminder of the way things were. My grandfather had tractors to operate his farm but the tools that attached to the tractor are now considered antiques. I enjoyed this post.